Home>New Songs>Nuez Songs> Key! & Nuez Make A Case For Monogamy On "Let's Make It Official"
It's Valentine's Day, and love is in the air. In honor of the unofficial holiday, Key! and Nuez have joined forces to bless the masses. Following Nuez's recent collaboration with Lil Baby and Hoodrich Pablo Juan, the producer has tapped Key! to inject a little romance into the game. In today's day of instant gratification and ongoing shift away from traditional marriage values, sometimes it's nice to hear a back-to-basics approach. Enter "Let's Make It Official," in which Key! offers an upgrade with finesse. Sometimes, things are simply too good to let slide, and certain topics must be broached. Should you have ever experienced the "what are we?" conversation, this one is for you. If not, and you're still waiting for that special someone to come your way, fear not. Key and Nuez can and will allow you to live vicariously. Behold their handiwork now, fellow romantics. Be kind to the ones you love. Can't no legs come near! Erick Sermon Taps Big K.R.I.T & Ricco Barrino For "That Girl"
SONGS Key! 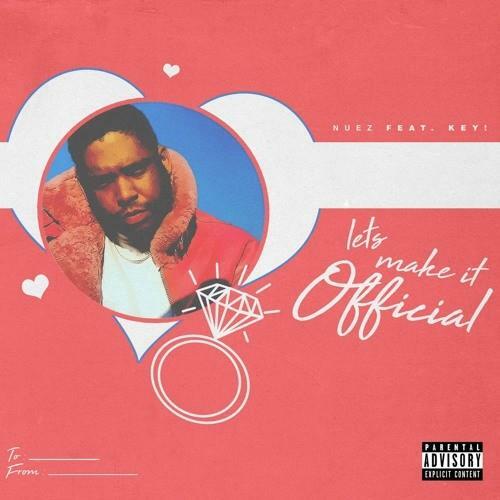 & Nuez Make A Case For Monogamy On "Let's Make It Official"